We are a well-known Manufacturer, Exporter and Supplier of precision made Tray Dryer. Tray Dryer, available with us, is known for its user-friendly operations and compact designing. We make available Tray Dryer in mild steel, stainless steel, etc. Avail precision made Tray Dryer from us at very reasonable prices. A Tray or Compartment Dryer is an enclosed insulated chamber in which trays are placed on top of each other in trolleys. The material to be dried either wet or solids are placed in the tray. 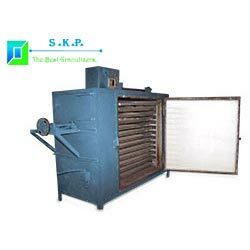 Heat transfer is done by circulation of hot air by electric heaters in radiator coils. Blower fans are installed inside to ensure proper circulation and transfer of heat. A control panel to control the temperature and other parameters is fixed outside the dryer. There is also arrangement of digital temperature controller. No & Diameter of Blower 1/25" 2/12" 1/28" 2/28" 4/28"